You are here: Home / Recipes / What’s a party without a Barfly? Meet The Best Whiskey Cocktail Ever! What’s a party without a Barfly? Meet The Best Whiskey Cocktail Ever! The occasion: My going away party, with friends and a sprinkle of co-workers. Never mind this was the third such party for the occasion – I write about liquor and have distiller friends, of COURSE there would be parties. Where was I heading off to? I was packing my worldly possessions (including several boxes of the aforementioned liquor) and heading off to learn to make whiskey at Asheville Distilling Company. Troy Ball is one of the most impressive people I’ve ever met, and she’s lovely and gracious as well. Learning to make her whiskey? File that under Dream Job. My theoretical knowledgeable was about to be put to the test. But first, there was a party, and delicious drinks to be had! 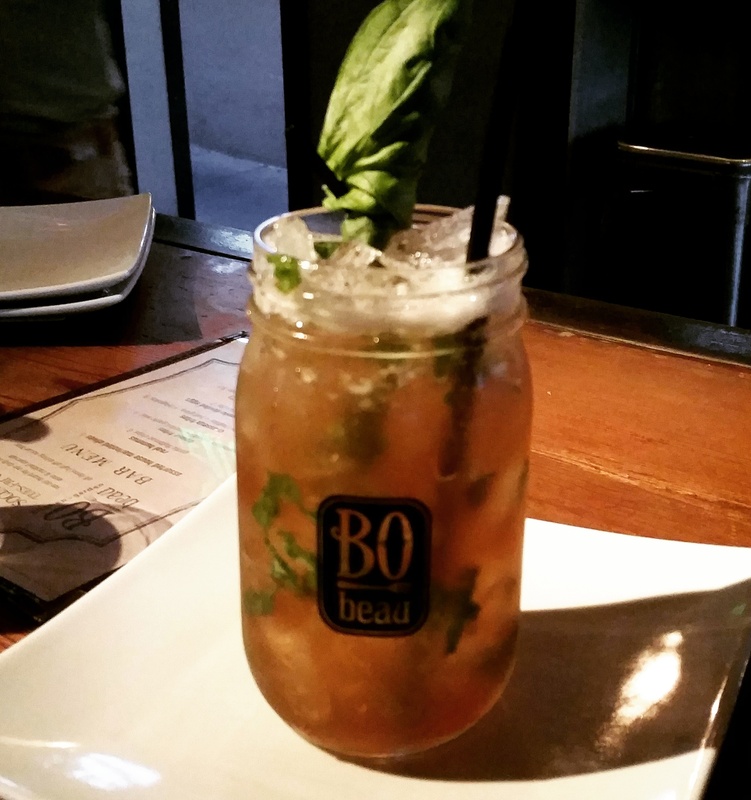 The location: One of my favorite local San Diego hangouts, BO-beau Kitchen + Restaurant. Not only is their food delicious, but their main guy behind the bar turned out to be Eater.com’s 2013 Bartender of the Year for San Diego! Talk about a local find! Vasilios Karatolis is an absolute genius with flavors, and was about to shake and stir the delightful concoctions for my official (and last) going away party. The drink: My go-to liquor is bourbon. As a writer of all things spiritous, I’ll try anything – twice if I like it. But most often, I end up with bourbon. You can usually find a decent bourbon at most bars, and a bartender that can make something that tastes good with it, if it’s not good enough neat. Vasili takes bourbon to an all new level, creating cocktails on the fly, sometimes subbing it out for other liquors in traditional recipes, sometimes making his own recipe. (Trust me when I say you haven’t lived until you’ve tried a Bourbon Paloma. I know, just do it.) Tonight’s adventure was all bourbon, all night long. Savory to sweet, hot, or cold, the drinks were fabulous. My favorite of the night was the aptly-named Barfly. Bourbon, a Vasili-made-for-the-occasion balsamic reduction, basil and ginger beer – individually, I like all those things. Together? The perfect blend with all the right notes, none overpowering the next, but working together as a great cocktail should. It was the first drink of the evening – a long evening of friends arriving at different times, which meant a new drink nearly every time! Several cocktails in (no, we’re not discussing how many), I was describing this particular drink and *might* have gotten a little tongue-tied. Yes, that’s what we’re calling it. Not slurring. Don’t be like that. And the Blarfly was renamed, by my highly-amused friends, which made it even better. Cheers to great friends and great drinks! And to the Best Whiskey Cocktail Ever! I see the ingredients in the drink but how much of each my first couple attempts were pretty bad. Could you post a recipe. For this drink. It sounds great. Hi Richard – I’m sorry for the delay. If you still want to try it, here’s Vasili’s recipe. Cheers!